TBG’s first bridal store is set up in Nungambakkam, Chennai. The best thing about our bridal store in Chennai is that we have exclusive collections of hand-picked bridal jewellery sets. In this article, we are going to see the benefits of visiting TBG’s bridal store for jewelry sets. Jewellery plays a vital role in the bride’s outfit. Each bride prefers to look unique and distinctive from others on the big day. So, we here provide a wide range of options to our brides. You can choose from 100+ varieties of handpicked latest bridal jewellery sets. Each bridal jewellery has its own distinctive quality and looks. The top 10 trending bridal jewelleries are imitation temple jewellery, original temple jewellery, naga jewellery, original zircon jewellery, American diamond jewellery, gold plated jewellery, imitation kundan jewellery, original kundan jewellery and many more. The reason we stand top in bridal jewellery is that we give more importance to maintenance. We repolish all jewellery sets after each rental service. Every bride would prefer to take a trial session before renting the jewellery sets. It is now possible in TBG bridal store in Nungambakkam, Chennai. Choose from the different collections of bridal jewellery sets and try it out. we have jewellery sets for different occasion like sangeet, reception, muhurtham and all the other aspects of the wedding occasions. The style and look of the jewellery differ from each other. Taking a trial session will help you to make a better selection and reduce your stress about your wedding makeover. It is always easy to rent bridal jewellery from our store. 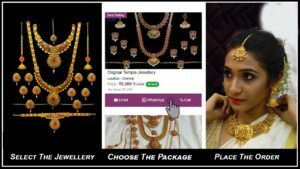 It is all about choosing the jewellery and placing the order. Pick the jewellery set that suits you and choose the rental days and make your payment. we have different ranges of budget friendly packages for all our bridal jewellery sets. You can choose the best package that suits your budget. We are keen in providing hand picked high-quality jewellery sets to our customers. All the bridal jewellery sets are finely coated with a perfect finish. Each jewellery sets are unique and different from each other. All our collections are identical and versatile in nature. Our jewellery sets speak its quality. The quality and finish of an imitation jewellery are equal to original gold jewellery. which give the brides an optimistic and intensive feel of wearing new and real jewellery sets on the wedding day. There are many exciting offers and discounts available in TBG bridal store in Chennai for jewellery rental. As a store launch offer, we provide free jewellery trial for all the trial makeup, discounted price for all types of jewellery sets and many more. Walk into the store and grab the exciting offers and discounts by booking our services. This is one of the biggest problems that all brides face after their wedding. Now, it is going to become easy for brides to return their jewellery sets. You can simply courier the jewellery sets to our store address. It is not necessary to walk into the store to return the sets. TBG always more concerned about user convenience so, it is always easy and comfortable in taking up service from us. Other than jewellery rental service, we also provide different kinds of makeup trial session and fashion designer consultation at a very low cost. There are exciting offers and discounts to other services like celebrity makeup package at the cost of high definition makeup package. Through this, you can save more than INR10,000. Additionally, we also provide free bridesmaid makeup for celebrity makeup package. Other than this, you can take free consultation with our fashion designer and get ideas in designing your wedding outfit. There are many more advantages in visiting our store as you can satisfy all your bridal needs in one place. Make your big day more special by taking up our bridal jewellery sets. Unknown facts about bridal makeup in TBG bridal Store in Chennai?